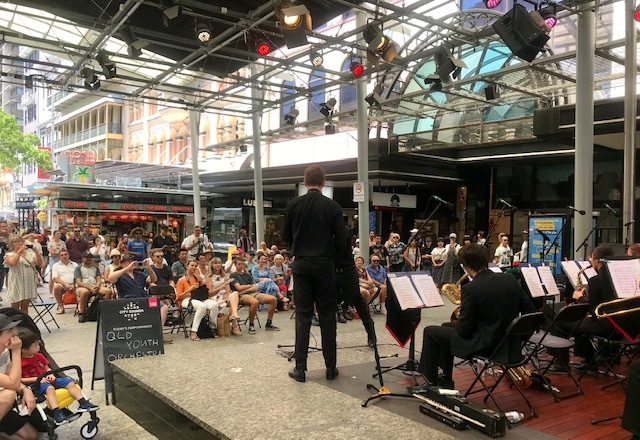 On Sunday 10 March the QYO Big Band performed their first concert for the 2019 QYO Big Band season at the Main Stage in the Queen Street Mall. 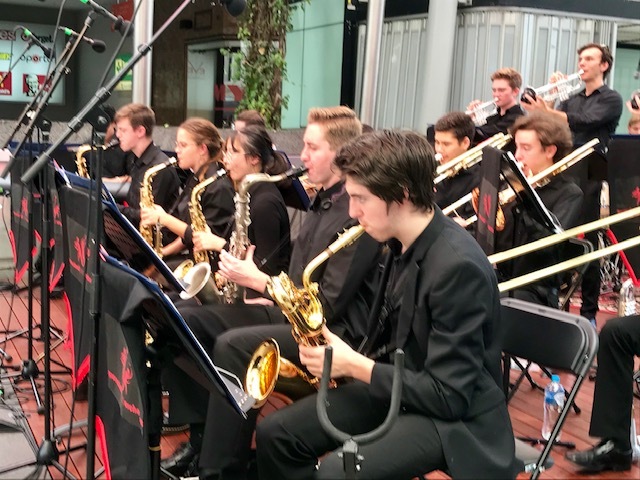 The Big Band has held only five rehearsals under the musical direction of Mr Bohdan Davison since the season commenced and has focused on establishing a repertoire that is both musically changing and entertaining. The repertoire for the Queen Street Mall both engaged and entertained the audience and included such favourites as I Can't Stop Loving You, LOVE (including actions by the band), First Circle, Ticker, John Brown's Other Body, US, North Beach Breakdown, and Bass Folk Song. The various charts showcased the big band improvisational instrumental soloists who were supported with much applause from the audience. The Big Band introduced a new vocalist this year with Alistair Hill proving a popular performer with the audience with notable standards such as How Sweet It Is and For Once In My Life, and Fly Me To The Moon. The Big Band performed two 30 minute sets at 12.00 and 1.00pm on the Main Stage. The band attracted and entertained the passing audience for the duration of their performance. Approximately 350 people stopped and listened and applaud the ensemble during each of the 30 minute concerts. 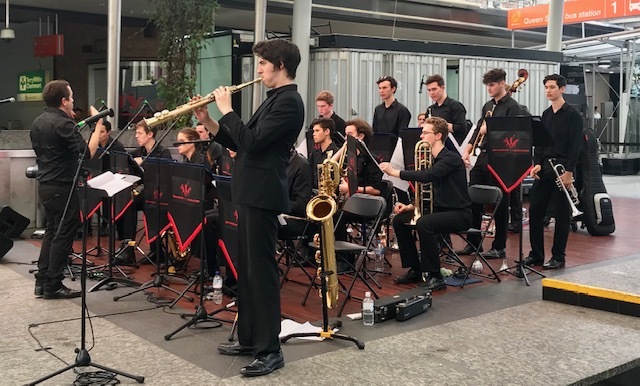 The QYO Big Band as always conducted themselves in an extremely professional manner, showcasing their extensive individual musical talents, and ability to perform as an exceptional big band ensemble, and as ambassadors for the QYO Program. 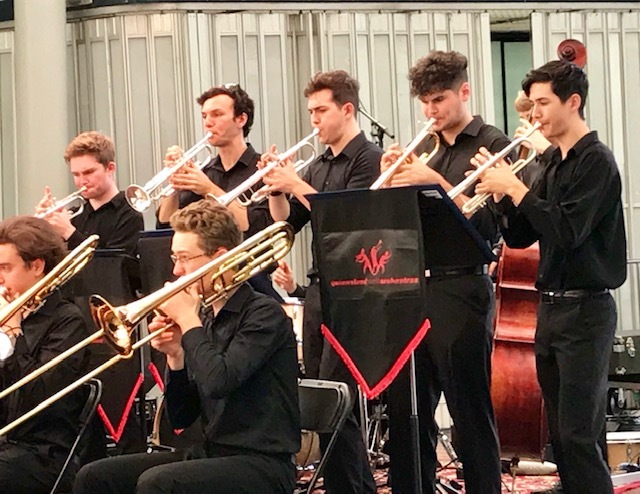 The 2019 QYO Big Band season promises to be a very exciting and busy season with numerous performances in a variety of settings planned to showcase the talents of this outstanding ensemble. 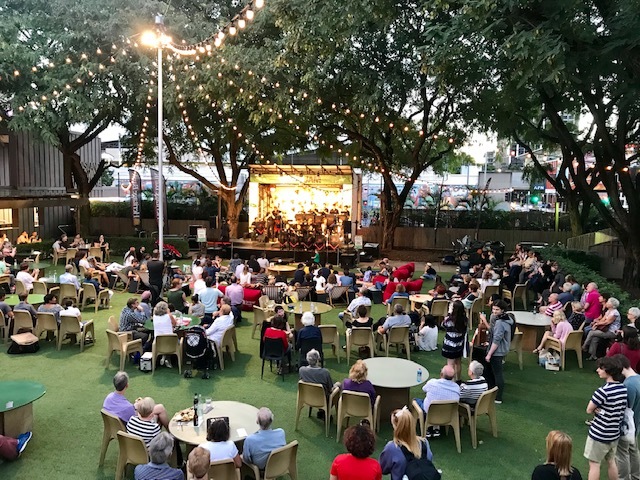 What a great way to finish a week with some jazz and swing under the stars on the green @ QPAC on a Friday evening. On the 5th April the QYO Big Band performed at Green Jam QPAC. 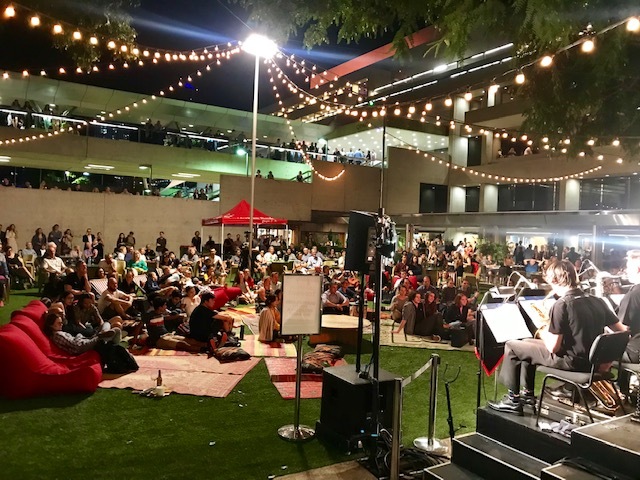 The Green Jam is an outdoor stage in the forecourt of QPAC. The QYO Big Band performed two 45 minute sets starting at 5.30pm and finishing at 7.15pm with a short interval. The QYO big bands performance at Green Jam saw a lot of successful firsts for the venue. 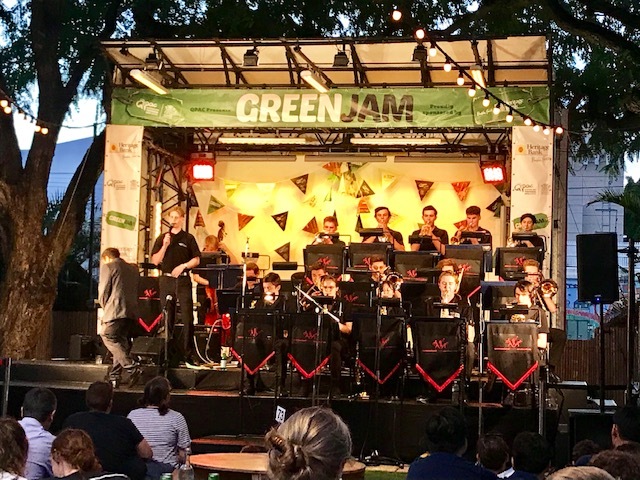 The QYO Big Band were the first big band to perform at Green Jam. They were the biggest group to perform at Green Jam and this required QPAC to extend the stage to accomodate the 20 piece ensemble. The Big Band drew the biggest audience an act has drawn at Green Jam. People walking past QPAC were drawn to the music and stopped to take in the performance. The big band held an audience of approximately 600 spectators for both sets. The big band was enjoying the big enthusiastic and responsive audience, really rising to the occasion and getting in the groove. 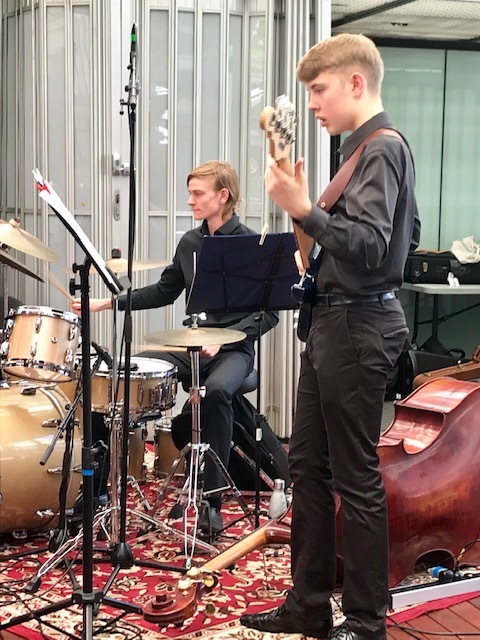 The Big Band Musical Director Bohdan Davison selected an entertaining repertoire for the gig which included a great variety of jazz and swing standards such as John Browns Other Body, US, After Supper, Bass Folk Song, LOVE, North Beach Breakdown. These charts all featured various instrumentals improvisational solos that showcased the extensive musical talents of the ensemble members. Alistair Hills vocal items such as How Sweet It Is, For Once In My Life, Beyond the Sea and Sway proved very popular with the audience. This was a great gig and a very exciting way for the QYO Big Band to close out the first part of the 2019 season.